New England's seasonal climate only allows residents and tourists a small window of time to enjoy the sun, sand, and surf, and they savor every minute of it. New England offers an incredible range of beach settings, from the playgrounds of the American aristocracy to charming islands rich in tradition. Dramatic bluffs, rugged coastlines, and the deep blue Atlantic waters make these beach towns the perfect places to spend the long days of summer. Lobsters and Maine go hand-in-hand, and Kennebunkport is no exception. Modern culinary culture is all about farm-to-table cooking and fresh, local ingredients, but long before this trend became globally popular, Maine's coast was peppered with dockside eateries serving bounty fresh out of the sea. The Clam Shack in Kennebunkport has been welcoming hungry locals and tourists since 1968. This no-frills eatery is located in the downtown area and is known for its heaping portions of fried clams and meaty lobster rolls. After a day spent enjoying Kennebunkport's beautiful beaches and charming shops, chow down at one of New England's most acclaimed seaside eateries. Accommodations: The Captain Jefferds Inn is an elegant 1804 sea captain's home. Tucked away in the heart of the historic residential district, the manicured gardens and exquisite guestrooms offer travelers a taste of the good life in Kennebunkport. No place is quite like Nantucket -- with a sophisticated culinary scene, pristine beaches, and charming artisan shops, it is a classic New England getaway. Once a quiet whaling community, the island is now synonymous with character and style, exuding an upscale beach-town vibe. So don a pair of Nantucket Reds and Sperry Top-Siders and live it up! Accommodations: Located along the cobblestoned portion of Nantucket's Main Street is 76 Main -- a Nantucket Boutique Hotel. Originally built in 1883, the impeccably restored hotel has been welcoming guests for more than 50 years. Rhode Island may be our smallest state, but with 400 miles of shoreline, it boasts some of the nation's finest oceanfront real estate. 23 miles south of the capital, Providence, is the seaside city of Newport. Known for its magnificent mansions and colorful yachting scene, Newport is one of the oldest and most famous resort towns in New England. Pass the summer days by sailing Newport Harbor and Narragansett Bay or strolling along the Cliff Walk with its breathtaking views of the surrounding Atlantic. Accommodations: The Attwater on Liberty Street, one of Newport's first hotels, offers nine distinct coastal-chic rooms and suites. The Attwater is secluded on a quiet street in the central historic district, yet the beach, restaurants, and nightlife are all within walking distance. Located at the tip of Cape Cod, Provincetown, MA is a haven for artists, fishermen, whale-watchers, and the LGBT community. 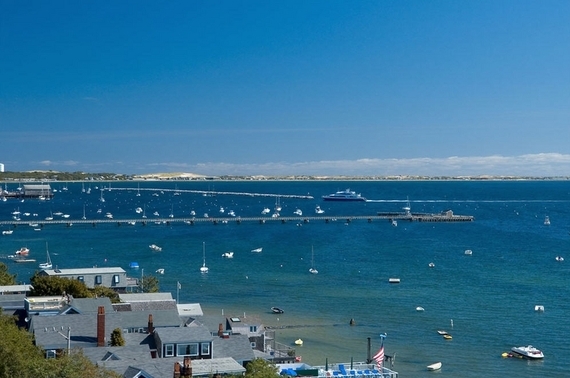 Provincetown boasts sprawling beaches and stunning sunsets, exceptional cuisine, vibrant galleries, and eclectic shops. In the off-season, Provincetown is tranquil, while during the warmer months, the beaches are lively and exciting. Stray off the beaten path far enough and you will be sure to find your own private ocean oasis. Accommodations: Perched high atop a hill in Provincetown's charming West End is the Land's End Inn. With 18 guest rooms featuring ocean views, a secluded private beach, and within walking distance to downtown, this inn is a perfect sanctuary for your Cape Cod stay. No matter where you stay in Ogunquit, ME, you are always within easy walking distance of some of the East Coast's loveliest beaches. From the center of town, follow the Marginal Way, a 1.5-mile oceanfront walking path, where the spectacular scenery will exceed your wildest expectations. While in town, be sure to visit the Ogunquit Playhouse, one of the only summer playhouses in New England still performing live musical theater. Accommodations: The quaint Ogunquit Inn is a 6-room B&B built in the 1800's. The inn offers guests modern amenities and one of the best porches for enjoying the rich sights, sounds, and smells of the ocean.